Personally, I think every parent should try to investigate some basic infant resus, because as those little blighters become more mobile and more curious they have a habit of picking more daft objects up to check if they are food or not. I cannot tell you how high we had to keep our first daughter’s brightly coloured school erasers in order to keep them away from our younger child. From what I saw on our Facebook page this morning, it seems like this is a technique already advocated in the US and Australia, but for the benefit of the UK and anyone else who is interested, here is the latest video as featured in a Sky news report. In fact, it differs only very slightly to the rather brilliant UK National Health Service video ‘How to help a choking child’. As an aside, it is also interesting to query the figures mentioned in the Sky News report, reproduced below. In a survey of parents of 1000 under-fives, 380 said they had seen their child choke, with only 50% knowing what to do in that event. There are two ways of looking at this… one, 190 children choked, and their parents didn’t know what to do but everyone (we assume, for Sky News would have looked for the goriest story possible) was okay. That’s encouraging (but still do your homework). The other way of looking at it is that parents STILL don’t know the difference between choking and gagging and some of the chokes were mis-represented gags. It is worth knowing the difference as going straight for resus when they’re dealing with a gag can cause babies to aspirate food. Gagging is actually a safety response to food travelling too far back into the mouth so when we see our babies gagging they are actually handling the problem and it’s best just to keep calm (or at least look calm) and wait until it passes. Choking, you will know about. The baby looks panicked, no or very little sound can come out, and lips may actually start turning blue. Be smart, educate yourself and know how to act quickly. “New first aid advice on how to help a choking baby has been issued to parents. St John Ambulance, the British Red Cross and St Andrew’s First Aid have updated their advice after research suggested that many parents did not know what action to take. The new advice is to place the baby face down along the thigh while an adult strikes the child’s back. First aid experts say this gives the baby more support compared with the previous advice, which was to place the baby along the adult’s arm. A survey of 1,000 parents of under-fives found 38% had seen their child choke. Half of the parents said they did not know the correct way to help their child or how to clear the obstruction. Nearly half said they avoided giving their child certain foods in case they choked. Clive James, training officer at St John Ambulance, said: ‘If an infant is choking then, in the first instance, they should be laid face down along your thigh and supported by your arm, give them five back blows between the shoulder blades with your heel of your hand. “Previously this was done along the arm but the leg is felt to be more secure and provide more support. “Check their mouth for any obstruction. If there is still a blockage then turn the infant onto their back and give up to five chest thrusts. “Use two fingers, push inwards and upwards against their breastbone. 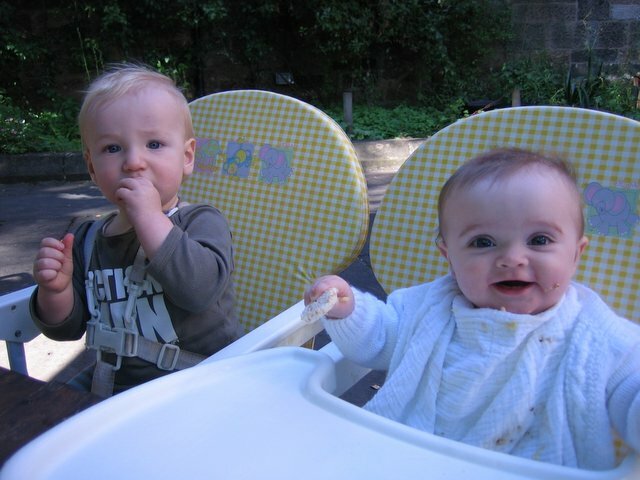 Baby Led Weaning Diary.. And it’s goodbye from Siobhan and some stuff about choking. Choking – why we need to stop uselessly fretting about it and instead Learn What To Do If It Happens.